The Fo Guang Shan Buddhist Order (佛光山) («Buddha’s Light Mountain») is a Chinese Mahayana Buddhist monastic order that has gained a worldwide presence, and has chapters around the world. Fo Guang Shan is also one of the two largest Buddhist monastery and largest charity association in Taiwan (Tzu-Chi being the other). Founded in 1967 by Venerable Master Hsing Yun, a popular Buddhist monk and scholar, the order promotes Humanistic Buddhism, a philosophy popular in the east. It aims to make Buddhism relevant in the world and in peoples lives and hearts. The order is part of the Rinzai Zen (Ch: 臨濟宗, Linji Zong) lineage of Buddhism. In 1967, Master Hsing Yun made plans to build a large Buddhist monastery in the mountains. During that time that was spent clearing the mountains, the endless toiling away, wave upon wave of physical strain, the planning that carried on into all hours of the day, the barrage of floods and other natural disasters, and the belligerent mobs that surrounded the mountain were all quite beyond description. On windy and sunny days, the workers clothes would be soaked in sweat, dried up, and then soaked up again. They would be discussing throughout the day and go to bed late at night, and then as soon as the sun came out, they would work again. However, in the momentum of an incomparable courage, and by the blood and sweat of the laborers, the vast wilderness was transformed into the scenic Fo Guang Shan today. In May 1997, Master Hsing Yun announced that he would close the mountain gate of Fo Guang Shan to the general public, causing a media frenzy in Taiwan. His reason in closing the monastery was to give monastics the cloistered atmosphere they need for their Buddhist practice. At the end of 2000, ROC President Chen Shui-bian and government officials from Kaohsiung visited Fo Guang Shan bringing with them the wish from their constituents that Fo Guang Shan re-open its mountain gate. After due consideration, Fo Guang Shan decided to re-open the monastery to some extent, thereby providing the public with a Pure Land environment in which to practice Buddhism. The social and medical programs of Fo Guang Shan include a free medical clinic with mobile units that serve remote villages, an annual winter relief program organized to distribute warm clothing and food supplies to the needy, a children’s and seniors’ home, wildlife conservative areas to protect living creatures, and a cemetery for the care of the deceased. The educational programs of Fo Guang Shan include four Buddhist colleges. The Chinese Buddhist research institute is further subdivided into four separate departments; a women’s and men’s college, and an international and English Buddhist studies department. Tuition fees and lodging are proved by Fo Guang Shan, free of charge. With the many colleges and universities, Fo Guang Shan also operates a normal high school in Taipei, which provides a regular curriculum for high school students. as well as nursery schools, kindergartens, and Sunday schools for children. Like Master Hsing Yun, abbots do not leave the order and go on their separate ways. At the end of their term of service, the abbots will go on making Dharma talks throughout the world at any time they can. Abbots are also the ones who succeed as the head teacher of the order in the event Master Hsing Yun dies. Dharma programs of Fo Guang Shan include lectures given in prisons and factories; programs on television and radio, large-scale public lectures in Taiwan and overseas, and the five precepts initiation given twice a year at the monastery. All branches of Fo Guang Shan organize pilgrimages to bring devotees to the monastery from different parts of Taiwan and overseas. Once pilgrims arrive, they are free to make use of all of the different activities that are open to the general public. 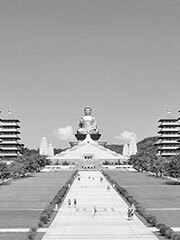 Over the years, Fo Guang Shan has endured much criticism, primarily during their efforts to build more branch temples and establish new BLIA chapters. Many have mistakenly felt that gifts given personally to members, have in fact been money donated to the organization, which requires that all donations to the order be accounted for. Critics have also said repeatedly that branch temples of Fo Guang Shan have been noted to be huge and extravagant (such as Nan Tien Temple in Australia and Hsi Lai Temple in the United States), which contradicts the Buddhist thought of not being attached to material things. The order responds by stating that modern people require modern facilities, and without these new facilities, few people would be drawn to the practice of Buddhism. The quarters of the monks and nuns themselves, are in fact very simple and unpretentious. These four stanzas are also the basic guidelines for members of the Buddha’s Light International Association (BLIA). Note that this is a partial list of the many chapters of Fo Guang Shan.